As the No Child Left Behind initiative waits to be reauthorized by Congress, a debate is stirring about how students should be tested and taught. As some teachers struggle to engage students in a school environment that is increasingly emphasizing test scores over creativity, one after-school workshop in Oakland, California is making use of a surprising model for contextual learning: tabletop roleplaying. "The Roleplay Workshop" takes kids age 10 and up and puts them in a Dungeons & Dragons-esque fantasy world called Abantey, where they can fight monsters, search for hidden treasure and learn ancient magical secrets - while brushing up on basic math, science and social skills. "We don't say that's what they're doing, but it's what they're doing," says Director Becky Thomas. Thomas, once a full-time teacher, started roleplaying with her students almost by accident 21 years ago at Archway Elementary School in Oakland. She was making maps for a game with her friends during study hall one day, when her students caught her and asked what she was doing. They were immediately interested and wanted to play. "We had so much fun, they asked me to do a summer program," Thomas says. After three years of hosting summer camps and after-school programs, Thomas quit teaching to run the workshop full-time. Today the after-school program is squeezed into a half-loft above Dr. Comics and Mr. Games in Oakland, where Thomas and her partner Steve Kani create fantasy adventures embedded with many opportunities to learn. From doing math exercises during combat to researching how much water a camel needs to drink while traveling in the desert, the students (34 are enrolled now, and about 100 last summer) are learning while they adventure. "Someone, somewhere must have done a study," Thomas says, "but I know I learn better when I am having fun." Assistant Marco Ginsberg, one of 18 student staff members at the program, worked at the Roleplay Workshop for three years before stopping due to scheduling conflicts. He says he has helped the kids flesh out the basic math skills they need to create characters and do battle. "Watching a student who previously couldn't understand the concept of averaging memorize it after a few stat checks is a special joy in itself," Ginsberg says. According to psychiatrist Dr. Adam Blatner, professor and author of Interactive and Improvisational Drama: Varieties of Applied Theater and Performance, there are two ways to learn: assimilation, or rote memorization, and accommodation, or learning by doing. Assimilated facts are easy to forget, but you never forget how to ride a bike. That could be part of roleplaying's value - it is learning by doing, in a sense. It allows kids to be as creative as they like, because they can solve problems in unexpected ways. 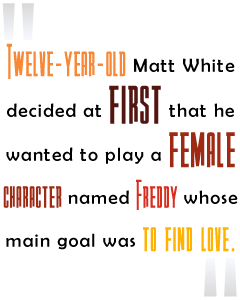 Twelve-year-old Matt White decided at first that he wanted to play a female character named Freddy whose main goal was to find love. After a few minutes, though, he decided to switch back to playing a male. "I sort of forgot I was playing a girl in the naming process," White says, with a sideways grin. His character's race, the Plajets, value humor in all situations - a value he was not forgetting. Thomas has seen that kind of role experimentation before. "I have seen the 'bullies' play characters that have strict codes of honor," she says. "They are getting to make a choice from a perspective they don't normally have." And they can also make mistakes. During one scene, a group of players were sent out to rescue a kidnapped girl. A monster attacked them in the night. After killing the animal, some kids decided to take the time to harvest its valuable scales. Although they were ultimately successful at rescuing the girl, the victory was dampened because she had suffered longer than necessary. "It's a lesson in choices," Thomas says.